Kitchen countertops see a lot of messes. 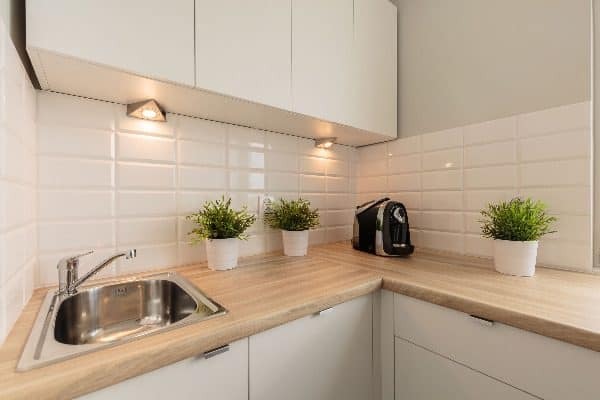 The countertops serve as a preparation area for food, so they need to be kept spotlessly clean and sanitized, preferably without leaving behind a lot of chemical residues. 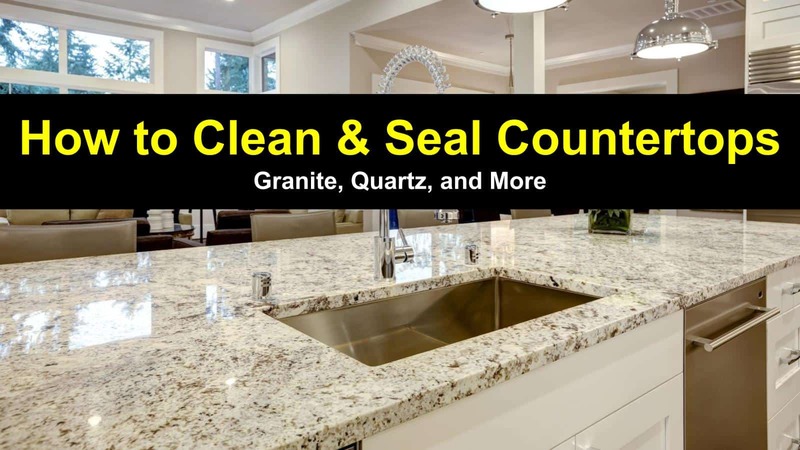 We’ll discuss how to clean granite countertops in more depth, but the best strategy is to clean up messes when they happen, then come back for a deep cleaning session on a regular basis to sanitize the entire area. How you clean your countertop depends on the kind of material you have. Natural stone countertops, such as marble, granite, and travertine need special care. Never use bleach, ammonia, vinegar, citrus, abrasive cleaners or harsh chemicals on your natural stone countertops. We will discuss cleaning these types of countertops later in the article. 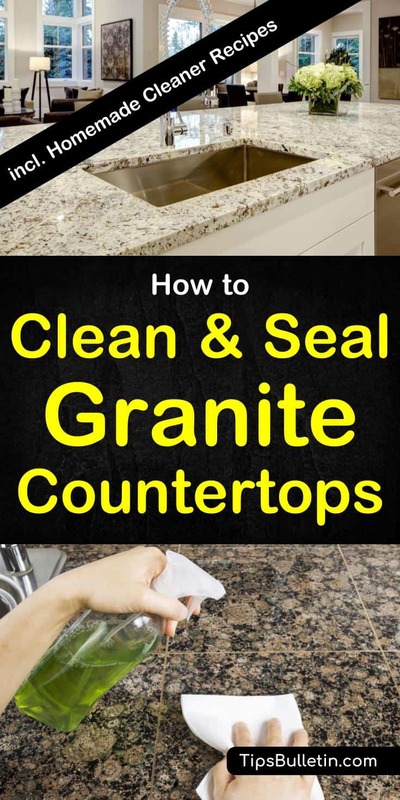 We will cover how to clean kitchen countertops, how to disinfect them, and when necessary, how to seal countertops using all natural homemade granite cleaner and polish recipes. Additionally, we will explain how to make natural countertop cleaners and disinfectants from ingredients you probably already have. Corian, granite, marble, travertine, quartz, and Corian stain quickly, so wipe up spills immediately, then clean with a pH balanced cleaner. Similar to cleaning a granite sink, avoid vinegar, lemon juice, bleach, ammonia or any cleanser with acidic or abrasive ingredients. When in doubt, look for cleaners specifically designed for natural stone countertops. If your countertops are corian, granite, or another type of stone, use the following directions to ensure they remain clean and beautiful. Remove all items from the countertop so you’ll have a clear space to work. Dust away the big stuff, like dirt and crumbs. Add a mild dish soap to your sink, or a bucket of warm water. Saturate a microfiber cloth in the soapy water and wring it out. Microfiber is the preferred type of cloth because it won’t fall apart the way paper towels will, but it’s still soft enough to clean surfaces without scratching or damaging them. Wipe down the countertops completely. Use a new dry cloth to dry and buff the counters. Stains that have soaked into the countertop can be difficult to remove, if not treated immediately. If you have a stain that does not yield to soapy water, you can try gently remove it with a little hydrogen peroxide applied directly to the stain. Let the baking soda paste stand for a day or two, then wipe it up and clean the area again with soapy water. The best defense against stains on a natural stone countertop is to seal it completely. 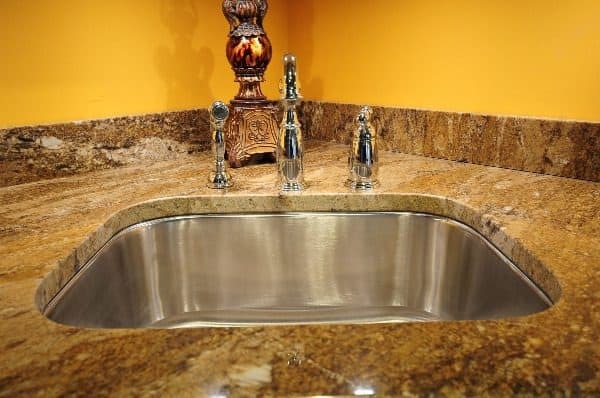 A sealed countertop will repel moisture and stains, while unsealed stone will soak it up. Your stone countertop was probably sealed when installed, but over time the sealant wears thin and needs to be re-coated. For best results, reseal your granite countertop every couple of years to prevent stains. You’ll want to start by removing everything from the area, so you have a clear surface to work. Clean up any dirt, debris, or spilled food quickly. That way, you’re minimizing the likelihood of letting a stain develop. Spray the area down with a good cleanser and allow it a few minutes to clean and disinfect the area. Then, use a clean paper towel or kitchen cloth to wipe the surface dry. This natural disinfectant method is not suitable for marble, granite, travertine or other natural stone countertops. For kitchen countertops, diluted bleach has been the go-to standard for many years. It doesn’t take much bleach to do the job; the solution needs to be made and used the same day for maximum effectiveness. Caution: Do not use bleach on marble, granite, travertine or other natural stone countertops. You don’t need heavy chemical cleaners for most household cleaning chores. Here are a few recipes for natural cleaners, but make sure you are following the guidelines and using the right cleaners on each surface. This antibacterial and antifungal cleanser cleans your kitchen surfaces naturally with essential oils. For a fantastic antibacterial kitchen cleanser, add distilled water, tea tree oil, and lavender to a 16-ounce spray bottle. Shake the bottle well to mix the ingredients, and begin cleaning. This easy to make citrus cleanser is suitable for use on most countertops, except marble, granite and other natural stone surfaces. 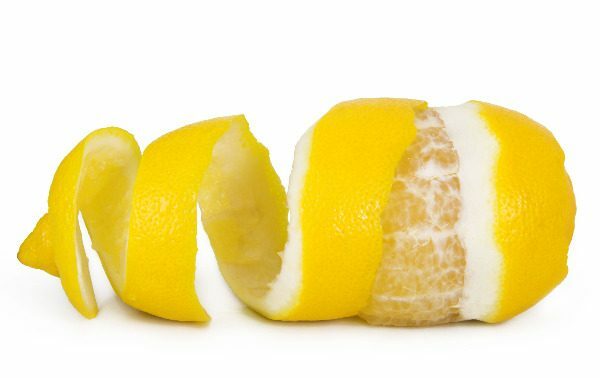 Both vinegar and citrus peel have natural cleaning and anti-microbial properties. Start by filling a jar with citrus peels. Use grapefruit, orange, lemon, lime, or tangerine peels with all the fruit removed. Cover the citrus peels with white vinegar and cover the jar with a tight-fitting lid. Allow the vinegar and peels to sit in a cool, dark place for one to two weeks. Strain the vinegar through a fine sieve or cheesecloth and pour it into a spray bottle. Dilute the orange vinegar with an equal amount of water and shake. Concrete or cement countertops are similar to natural stone in many ways. The surface can be sealed or unsealed and prone to staining. Unlike when you remove oil stains from a concrete garage floor, a sealed concrete countertop resists stains well, but abrasive cleaners and sharp objects tend to damage it. Unsealed countertops require more aggressive scrubbing to prevent or remove stains. Use a simple mix of lemon juice and white vinegar to remove light rust stains from the concrete surface. I hope this tutorial was helpful and answered all your questions about how to clean kitchen countertops. Cleaning and disinfecting your kitchen countertops keeps them looking great longer and keeps your food preparation safe. If you found this information helpful, please use the buttons below to share to Facebook, Twitter, and Pinterest so others can benefit as well.